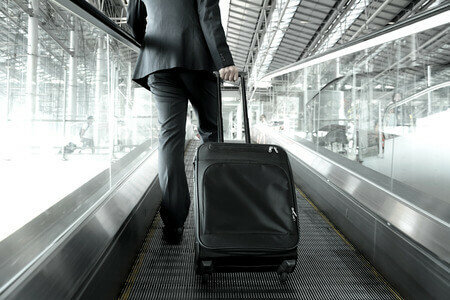 Successfully maneuvering through a busy airport is a true sign of a seasoned business traveler. Managing long security lines, mindful packing, and hitting deadlines is a balance that few can handle. Below are a few of our favorite and most effective airport travel tips that keep us on track and ahead of the game. Download your airline/airport app before leaving. While you still have adequate wifi, download the app for your airline or even airport. Usually, it comes with additional perks – like access to the plane wifi, free entertainment, your flight details, and more. Some airlines, like Delta, can even automatically check you in to the flight 24 hours ahead of time if you have the app installed. Follow AskTSA on Twitter. Not sure if a certain item is allowed on the plane? Tweet to @AskTSA for a quick response on any packing issues before you head to the airport. Wear a pocketed jacket. Clutter is the enemy of smooth travel. Wear a jacket with additional secured pockets to keep from rummaging needlessly through your luggage. Keep anything at hand you might need through the airport, like charging cords, a granola bar or driver’s license. Use quick-release straps to keep bags together and organized. These easy-to-use and affordable straps will clip all of your luggage together, making it easy to maneuver through the airport and additional travel. Take your vitamins. Not to sound like your mother here, but she does have a point. Airports are chock full of germs and viruses. Even if you don’t think you’ll need it, keep a supply of multivitamins, cold relief medicine, cough drops, antibacterial wipes and tissues with you while traveling. You may feel over prepared, but it will beat purchasing the shockingly overpriced medicinal items in the airport or hotel. And should you end up next to someone under the weather, you’ll be prepared with an arsenal of supplies. Stay hydrated. Air travel literally dries you out. Remember to stick to water while traveling and avoid alcohol and excessive salt. Always plan for abysmal wi-fi. Whether in the airport or on the plane, assume there will be no wifi. Even with the many advances in wifi and wifi providers, something unreliable always seems to come up. Instead, bring work items with you that don’t require internet access. Download a whitepaper before leaving, read an industry-related book, or focus on re-organizing your computer desktop. If you do have internet access, say a silent prayer for your good fortune, and keep your back-up items for another time. Get a day pass to a lounge. Or, perhaps bypass the slow internet, shortage on seats, and wait on outlets completely. Sign up for a day pass to a business lounge using LoungeBuddy. Now worldwide, LoungeBuddy provides single-use passes, depending on availability. If you’re on a sudden delay or just need a place to unwind, keep this site in your back pocket. Whether you are a seasoned roadwarrior or new to business travel, there is always room for improvement as you travel through the airport. We hope you try out these tricks on your next adventure. Did we miss any of your favorite airport travel tips? Post them below in our comment section. Christopherson Business Travel is a corporate travel management company with more than 60 years of experience. We’re known for our full-service approach, custom technology, and superior customer support. Contact us to learn more about our dedicated services.